Comedian, television political talk show moderator. Born William Maher, on January 20, 1956, in New York City, to an Irish Catholic father, Bill, who was an NBC news editor, and a Jewish mother, Julie, a retired nurse. He has one older sibling, sister Kathy, who is an English teacher. Maher was raised in River Vale, New Jersey, and attended Pascack Hills High School. He majored in English at Cornell University, in Ithaca, New York, and completed his bachelor's degree in 1978. Upon graduation, Maher began appearing at comedy clubs in NY and Los Angeles, and got small roles in a few forgettable feature films and TV series, including D.C. Cab (1983), the TV series Sara, starring Geena Davis (1985), and Cannibal Women in the Avocado Jungle of Death. In 1990 he hosted a short-lived CBS series Midnight Hour, and got a solo gig on the cable station HBO's One Night Stand series in 1992. In 1993, Maher began the show that would make him famous, Politically Incorrect with Bill Maher, which got its start on the cable station Comedy Central. It was the perfect forum for Maher's acerbic, smug but also self-mocking, comic tone. Maher would introduce a hot social/political issue, invite four guests from disparate camps (from political columnists and writers to sitcom stars to rock musicians to athletes, to actors, and other comedians), let the discussion take off, and insert his own opinionated, wry comments in between. The show was an instant success, and Maher won three consecutive CableACE awards for best Entertainment Host. After three years, ABC picked up the show to air after Nightline, and to counter against the second half-hour of The Tonight Show with Jay Leno, and The Late Show with David Letterman. Shortly after the September 11 attacks on the World Trade Center, Maher remarked on-air that the U.S. had been more "cowardly" than its attackers. The remark prompted a public outcry, including a dressing-down from the White House and the departure of a number of the show's sponsors. As the show's title suggests, Maher was never one to shy away from controversy. Nevertheless, his relationship with ABC never truly recovered. The show's five-year run on ABC came to a close in June 2002. 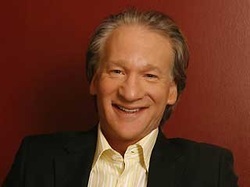 In 2003, Maher shifted to cable television to host Real Time with Bill Maher on HBO. He has also made a few television comedy specials, including 2005's Bill Maher: I'm Swiss and 2007's Bill Maher: The Decider. In 2008, Maher explored the world religions with the film Religulous, which was directed by Larry David.